I recently realized that even though most of my time is spent at work, I rarely show my work outfits here on my blog. I figured I'd give you guys a peek into my everyday work wardrobe since I always find it interesting to see how people style their office attire. My office is quite casual for a law firm so we typically don't wear suits unless we're going to court or meeting clients. I still like to dress up a bit though, so my usual outfits consist of silk blouses and pencil skirts. I'm also a huge fan of well-tailored dress pants like these navy wool ones from Theory. And can I just say how excited I am that J. Crew will be opening in Vancouver soon? No more dealing with missed deliveries for me! You look great! I'm always interested in how people dress for work. 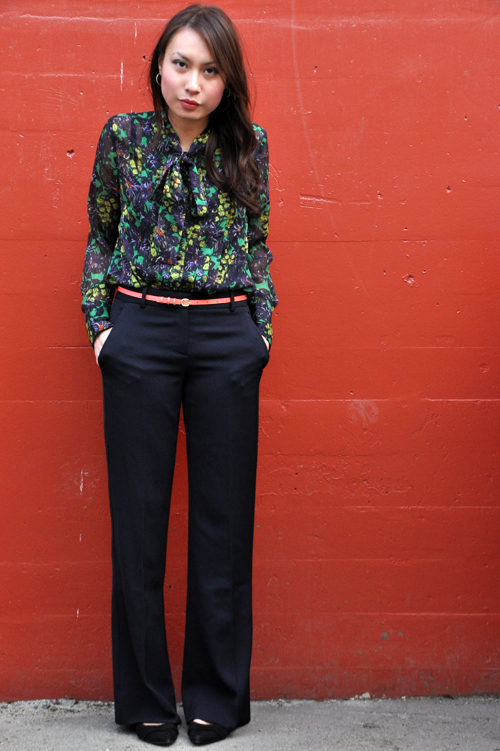 Such a great work look - I love the patterned blouse and the pants are so nicely fit/tailored. Awesome outfit. Professional, but still fashionable! Thanks, Sheila! Gotta make use of my makeup stash on a daily basis or else I'll never finish anything! I didn't know you were a lawyer! What kind of law do you practice? You might know my papa at Grant Kovacs Norell. Anyway, given that I know the whole law scene in Vancouver relatively well thanks to him, I think I can make a relatively well-informed assertion that you're probably the best-dressed lawyer in town. That second pic of you is beyond stunning, and seriously loving how fun yet professional this look is! I am exactly the same way! I thought about it, and I never post my work outfits on my blog! But they're probably nicer than what I wear on a normal day, because they're more put together and dressed up! Love your outfit. Way to bring the floral trend into the office! That blouse is gorgeous. How much do you love Theory pants? Aren't they just the most well made slack around? I am obsessed with Theory for work wear. Everything is so impeccably tailored! wooow...just so sophisticated and chic beyond words!! you tied in the blouse, floral print, belt, and trouser pants so well! Love how you took the photo in front of the red wall! Oooh, that blouse is just gorgeous!! I am also so excited about J. Crew coming to Vancouver! Theory pants are amazing, you look fab! That blouse is stunning. What a perfect work look! Your dress pants are amazing and I seriously think you're the most stylish lawyer I've ever seen! Ooh I should try Paul's Omelettery and Caffe Barney. Let me know if you go to Red Wagon and how you like it! I tend to always be overdressed but I kind of like it! umm... you look amazing. LOVE this outfit, alison! I love the color of the belt contrasting against your black pants. LOVE IT! hey babe! I am just starting again with my blog. I hope you can check it. Feel free to stop by my blog and follow it as well if you like. PS: Awesome outfit, I like office outfits they look so chic and elegant. Nice spring outfit!!! Like it!!! a wonderful outfit! I really love the blouse! Love this outfit on you, Alison! The colour is really refreshing to see in offices where most people wear their black, white & grey. I absolutely adore that blouse - so bold and graphic! I absolutely adore your blouse!!! I've been looking for something similar for a while now...and you've paired it perfectly here! 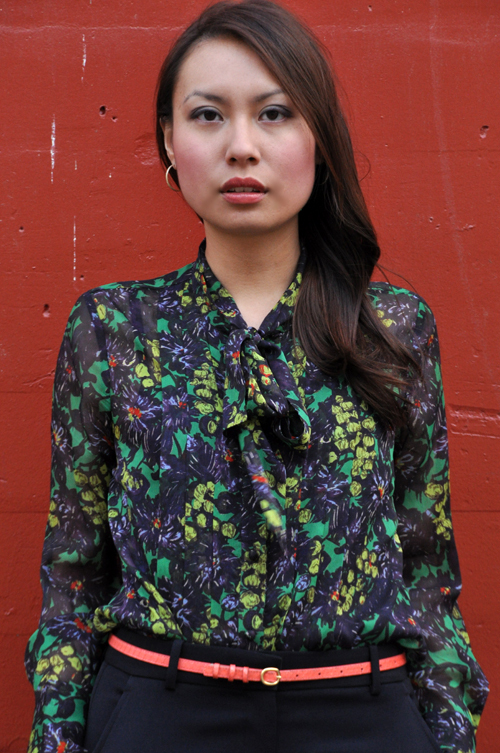 I love a bright tie neck blouse! I have to start featuring my work outfits as well, it's the reason I don't post personal style posts more often - You look great. The pants fit very well. PS: How are Aldo shoes in terms of comfort? I need new work shoes - my Nine West are no longer cutting it, my feet are killing me! They are kind of hit or miss for me. These ones are suede which are more comfortable but I find the patent leather ones too painful. Great slacks and print blouse, perfect! Cute blouse! Love the pussybow! love your black slacks :) such a classy look :) and thanks for your sweet comment! i'm holding a giveaway for the tights next week! i loveee your work outfit! you look so stunning in these photos! that blouse is so chic on you and i love that you added that pop of color with the thin belt! you must do more work outfits!!! This is a really great work outfit. I love the pattern of the blouse. It's a refreshing take on work attire. Very lovely! Great outfit. I love the floral print of the blouse. I have been loving the bow blouse lately, it looks great. Where do you usually shop for pants for the office? I have such a hard time finding them. Most of my dress pants are from Club Monaco. I also like Theory (on the pricey side though) and I stop by EXPRESS whenever I'm in Seattle for cheap ones. I really love this gorgeous blouse - you look great!! Alison, you're so pretty! I love this outfit and as a future professional, I would love to see more and more work outfits from you. Hi Alison how are you hope you good. Alison I love your work wear outfit you look stunning. Keep beautiful.